"The main reasons for the increasing attractiveness of the properties in the mountain resorts are, on one hand, the tempting low prices and, on the other - the improved infrastructure, the easy and fast access to and from the big cities, the accumulated experience in the management and maintenance of the complexes - turning the ski resorts into areas for year-round tourism," commented Polina Stoykova, Executive Director of a real estate company. This allows for more complete use of the property, prolongs the season and leads to the possibility of realizing profitability, which is an additional incentive to buy, she adds. 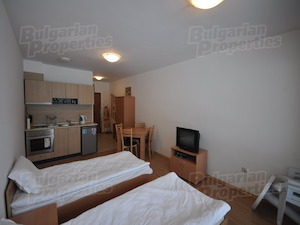 A furnished studio in an aparthotel in Bansko can be purchased for under 18 000 Euro, considered it even has a top location at the foot of the mountain and is set in the immediate vicinity of the first station of the cabin lift. One-bedroom apartment near the ski slopes in Pamporovo goes for about 23 000 Euro, given the fact that the apartment is part of a luxury gated complex, surrounded by a magnificent pine forest and situated right next to the ski slopes.